The AANA was able to secure language recognizing CRNA pain management fellowships in the National Defense Authorization Act (NDAA) for Fiscal Year 2018. Specifically, it encourages the Secretary of Defense to establish educational opportunities for CRNAs to attend accredited CRNA post graduate pain management fellowships. The language was included as an Item of Special Interest in the Chairman of the House Armed Services Committee’s report for the NDAA, meaning it cannot be amended or changed before the bill becomes law. Although the AANA’s ultimate goal is for the language to be permanently placed in the underlying NDAA bill, this is a major achievement. As part of the Department of Defense's Long-Term Health Education Training (LTHET) program, the language will bolster the AANA's argument that CRNAs are recognized by the federal government for their role in chronic pain management. The NDAA passed the House of Representatives on July 14. It remains one of the few pieces of legislation that is consistently signed into law each year. The 2017 proposed AANA amendments and resolution to be discussed and voted upon at the September 9, 2017, AANA Business Meeting are available online now. See the business meeting agenda. If you do not have online access, you may request that a hard copy be mailed to you via a message to mscheuermann@aana.com or phone (847) 655-1101. Cantrell Drug Company is voluntarily recalling all lots of unexpired sterile drug products due to lack of sterility assurance. The recalled products were distributed to health care facilities nationwide, except to the states of Connecticut, Hawaii, South Carolina and Vermont. The affected products include all lots distributed February 16, 2017, to July 19, 2017, remaining within expiry, and they would be packaged in a syringe or IV bag. Read the full announcement. 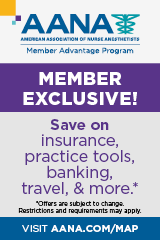 There's a New Way to Participate in the Business of the AANA! The new electronic voting on the proposed bylaw amendments and resolutions will begin with the September 2017 AANA Business Meeting. On Saturday, Sept. 9, 1 p.m. PDT, the AANA Business Meeting will be live streamed with access through AANA's website. On Sunday, Sept. 10, all eligible voting members of the association will receive an email allowing them to vote on the proposed bylaw amendments and resolutions. You will also have access to a recording of the debate on the specific issue. Voting will be open for 24 hours. Be sure to update your email address in AANA's records, and watch for your voting email on Sunday, Sept. 10. This comprehensive workshop combines enrollment for two of our most popular live CE activities, the Essentials of Obstetric Analgesia/Anesthesia Workshop and the Spinal and Epidural Workshop. According to a new study, caffeine impacts physiological function in ways that can help patients return more quickly to an alert state after general anesthesia. For one, the stimulant elevates the body's level of cyclic adenosine monophosphate (cAMP), which regulates cell function and has previously been shown to accelerate recovery from general anesthesia. It also interferes with a compound called adenosine that, upon binding to its receptors, slows down the nervous system and promotes sleepiness. The animal model, appearing ahead of print in the Journal of Neurophysiology, showed rats exposed to general anesthetic waking up as much as 55 percent faster when injected with caffeine as opposed to a placebo solution. Further testing using the adenosine receptor antagonist preladenant and forskolin, a plant-based supplement that increases cAMP, revealed that both agents also shortened recovery time from general anesthesia. However, neither did so to the same extent as caffeine, which stimulated both physiological changes. Subsequently, the researchers conclude that while the faster recovery produce by caffeine is probably mediated by block of adenosine receptors, increase in cAMP likely is the primary driver. From "Caffeine Shortens Recovery Time From General Anesthesia"
New evidence shows a greater likelihood of future dementia in older surgical patients who experience postoperative delirium (POD). While the association between POD and dementia has previously been demonstrated, the Mayo Clinic study is the first to investigate the pattern in a study population with no preoperative history of cognitive decline. With slightly more than 1,150 participants, 9.5 percent presented with mild cognitive impairment or dementia a median nine months after surgery. Such diagnoses were more prevalent, however, in patients who had suffered POD, at 33.3 percent, compared with just 9 percent in patients who had not. "Either [delirium's] a marker," speculates Mayo anesthesia provider and senior study author David Warner, MD, "or maybe there's something about developing delirium that increases your risk for dementia." If delirium does, in fact, elevate the chances of dementia, he says solutions might include changing anesthetic techniques or adjusting postoperative pain management approaches. The study is reported in the British Journal of Anaesthesia. From "Confusion After Surgery Linked to Later Dementia in Older People, Study Finds"
The Bone and Joint Journal reports on a U.K. study that shuns femoral nerve block during knee replacement surgery in favor of a new pain-management approach. Rather than injecting a single dose of local anesthetic into the femoral nerve in the groin, the new technique entails pumping anesthetic around the knee joint. The study at University Hospitals Coventry and Warwickshire included 250 patients, with those receiving the knee injections requiring lower doses of postoperative opioids. In addition, because the approach can be performed without ultrasound or other specialist equipment, it saves surgeons and anesthesia providers time and enhances patient care. "These injections are shown to be safe and effective," confirms lead study author Peter Wall. "They also involve fewer resources and reduce the need for powerful painkillers such as morphine. This is to be welcomed as the potential risks of morphine-type pain relief are well known and should be avoided where possible." From "New Study Recommends Alternative Pain Relief for Knee Replacement Patients"
Intravenous ketamine appears to work as an antidepressant in seniors, finds a new study investigating the anesthetic in this function. The research—the first randomized controlled trial to breach the subject—was conducted in Australia with 16 participants aged 60 years or older. The patients, who did not respond to traditional interventions for depression, received increasing doses of ketamine over a five-week period, with an active control treatment replacing the anesthetic for one treatment session. To investigate the efficacy of multiple doses, participants also underwent 12 additional ketamine treatments during an ensuing open-label stage. At followup six months later, 43 percent of the patients who completed the trial had achieved remission. Repeated, titrated doses also were associated with a greater chance of remission or prolonged time to relapse, with an overall response and remission rate of 68.8 percent for patients receiving ketamine. "These results are a promising early piece of the puzzle, but the risks of ketamine are still not wholly understood," said lead author Prof. Colleen Loo of UNSW Sydney. She and her colleagues reported their findings in the American Journal of Geriatric Psychiatry. From "World-first Ketamine Trial Shows Promise for Geriatric Depression"
Researchers are examining whether real-time needle-tip spectroscopy might be a viable alternative for epidural steroid injections which, although safe and effective, still occasionally are marred by dural puncture and wrong-site tissue injection. Clinicians typically use the loss-of-resistance approach, which investigators say lacks specificity. Spectroscopy, on the other hand, is able to identify tissue type—which might allow it to improve epidural needle placement and avoid mistakes that can potentially result in spinal cord injury or stroke. Led by Thomas Anthony Anderson, MD, PhD, an anesthesia provider at Massachusetts General Hospital and professor at Harvard Medical School, investigators tested how accurately a 500-mcm outer diameter Raman spectroscopic probe could identify different tissues in a live animal model. "The probe-in-needle appears to identify all tissues from skin to spinal cord necessary for epidural placement, and will allow us to do simultaneous loss of resistance," Anderson told the 2017 annual meeting of the Society for Technology in Anesthesia. "It looks very promising." His team expects to launch studies on human cadavers and, after that, a trial involving healthy human volunteers. From "Miniature Raman Spectroscopic Probe Could Improve Epidural Needle Placement"
The discussion continues over whether music is a help or a hindrance in the operating room (OR). Many cite the soothing properties of music for helping to relax OR staff and improve their performance. Others, like the anesthesia providers polled for a 2013 study, suggest that it can keep the team from functioning at the highest level. Some 54 percent of survey respondents said music can become a distraction if and when surgical issues arise, and 26 percent felt that music lessened their own vigilance and interfered with team communication. The interconnectivity offered with the "Internet of Things" (IoT) may be one way to harmonize OR clinicians on the matter of music. The premise is that anything that can be connected—from devices to equipment to appliances—will be. The technology is already in place, with smart homes representing one example. But it also could potentially have a place in the medical setting. One IoT invention, for example, allows for music enjoyment in the OR but shuts it down at times when concentration and focus are most needed. The device takes it cues from a growing list of OR monitors with which it is interoperable. Based on changes in vital-sign algorithms, it mutes music playback during anesthesia induction and emergence, the actual operative period, and other high-stress times for OR teams. Not only might IoT technology sew up the divide between those for and against music in the OR, but its ability to sync smart monitors can be used to improve overall OR performance. From "Sound the Alarm: Making Music in the OR Smarter"
Medscape (07/13/17) Burdick, Kendall J.; Schlesinger, Joseph J.